The Starbucks Foundation was created as part of our commitment to strengthen communities. We started in 1997 by funding literacy programs in the United States and Canada. Today we’re supporting communities around the globe. The Starbucks Foundation gave $6.9 million in 2015, making 128 grants to nonprofit organizations. Grants included $3 million for Starbucks Opportunity for Youth Grants and $1.5 million in social development grants. In 2015 Starbucks Corporation gave $29 million in cash, including $14 million to the Starbucks Foundation. Corporate giving included funding for community-building programs – including the Global Fund through our partnership with (RED)™ and other efforts – and $29.3 million in in-kind contributions. The Starbucks Foundation believes in providing young people, ages 16 to 24 years old, with pathways to opportunity by investing in programs that equip young people with the skills required for the changing global economy. The Starbucks Foundation also supports our partners' (employees) engagement in their local community through Partner Match and Community Service Grants. These programs provide matching grants to nonprofits where our partners’ made personal monetary and time contributions. Coming together in service represents a fundamental act of citizenship for individuals, businesses and community members to create a stronger, more cohesive society. 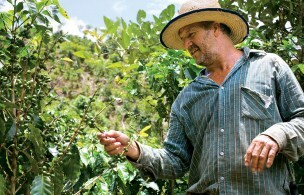 Our commitment to communities extends beyond our stores to include the regions that supply our coffee, tea and cocoa. Starbucks invests in programs designed to strengthen local economic and social development. We work collaboratively with non-governmental organizations that have experience and expertise in working with farming communities in the countries where coffee, and other agricultural products are raised. Projects include improving access to education and agricultural training, microfinance and microcredit services, improving biodiversity conservation, and increasing levels of health, nutrition and water sanitation. Ethos Water began as a social venture startup with the goal of providing people in developing countries with access to clean water. For every bottle of Ethos® water sold in the United States, 5 cents is directed to the Ethos© Water Fund to help finance water programs around the world. Since 2005 $13.8 million has been granted through the Ethos Water Fund, benefitting more than 500,000 people around the world. The Starbucks Foundation believes in creating pathways to lifelong opportunity for young people. We are proud to partner with organizations who are providing the training and experiences needed to help opportunity youth become job ready. Learn more about the countries and organizations we work with to strengthen Farming Communities.